What's in Your Writing Center? 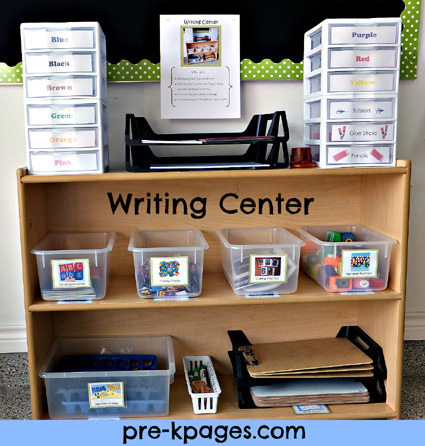 Today I’ll be sharing pictures and descriptions of my writing center with you. This is the second post in my “What’s in your… center?” series, if you missed the first post titled What’s in Your ABC Center? you can find it HERE. At the top is a picture of the entire writing center and below I have included close-up pictures of each shelf and listed the materials pictured. Cutting Practice: I collect the fronts of old greeting cards and place them in the writing center. Students cut the pictures out and glue them to paper and then write about their pictures. They are highly motivated to use the cards; it is one of their favorite activities at the writing center and a great way to practice fine motor and scissor skills. The thickness of the cards offers more resistance, which makes it easier for little hands to cut. Alphabet Punches: Punches are another great way to practice fine motor skills as well as letter identification. 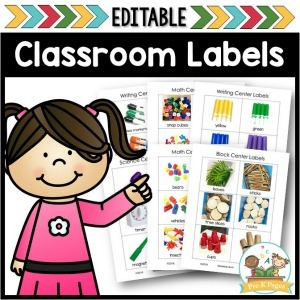 Students punch out the letters in their names, names of friends, or words and glue them to paper. 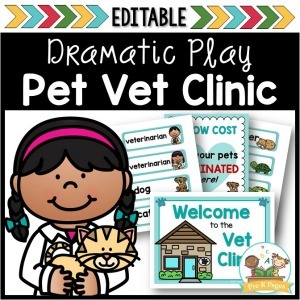 Clipboards: Students place sheets of blank paper on the clipboards and walk around the room recording their observations or copying print. 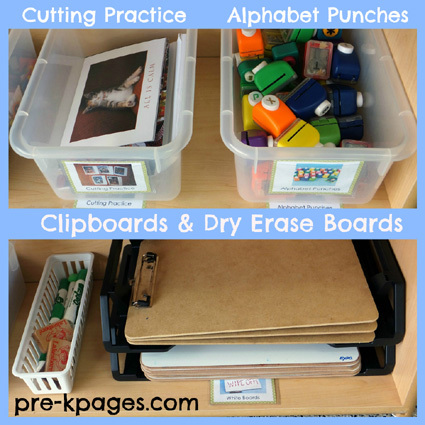 Dry Erase Boards: The clipboards and dry erase boards are placed in stacking file trays for easy access. 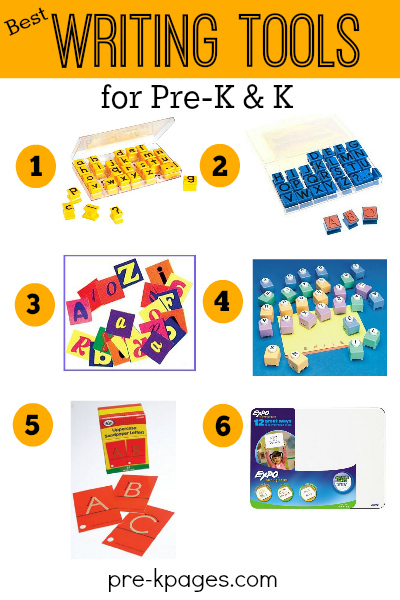 Alphabet Stamps: The alphabet stamps are housed in ice cube trays for easy access and organization. Use a permanent marker to label each empty space in the tray with a letter and the students match the stamps to the correct space. The students enjoy stamping their names, names of their friends, or words. Writing Center Sign: There is a sign in each center that lists the educational benefits of what we are learning. You can read more about these signs HERE. Paper: Paper is an important part of any writing center. I have several different types of paper available for students to choose from; regular white copy paper, half sheets of copy paper, and half sheets of construction paper so they can make covers for any books they may create. Sandpaper Letters: Students use half sheets of paper to create crayon rubbings of the sandpaper letters. This is great fine motor practice because holding the skinned crayon requires students to use the muscles in their hands and also the muscles in their shoulders and arms. Pasting Pieces: The alphabet pasting pieces are always huge hit. Students like to glue the letters to paper and spell their names and the names of their friends or even words. 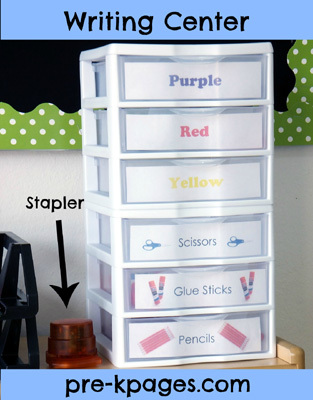 The writing supplies such as markers, pencils, scissors and glue are stored in a plastic drawer organizer. I have also used this method for storing and organizing markers. Each table in the classroom has a caddy stocked with crayons so I don’t have a separate storage space for them in the writing center. There is also a kid friendly stapler in the writing center that doesn’t require staples. It only staples up to 3 or 4 sheets of copy paper at a time but that’s usually plenty. Here’s a picture of one of the table crayon caddies below. I just love your writing center, it’s so inspirational! I need to figure out a way to get more room for mine. 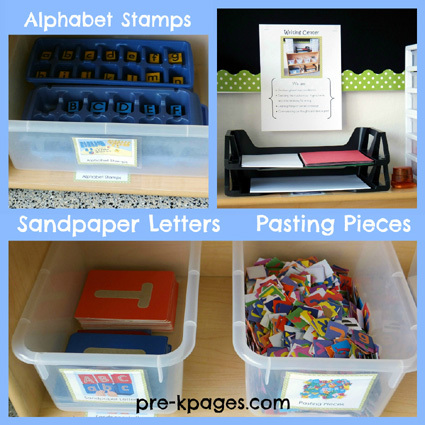 I love the sandpaper letters idea. 🙂 My writing center also includes blank pre-stapled books for writer’s workshop! Thanks for stopping by Jessica! I’m glad you like the writing center. Finding space for everything is definitely the biggest challenge- good luck! This is too funny! I got up in the middle of the night last night to look thru my teacher’s notes to find a list of items that make a great writing center – I just re-organized my room for the new 2nd semester and created a large center for writing. Then, I wake up this morning and see your post in my e-mail! Too funny! 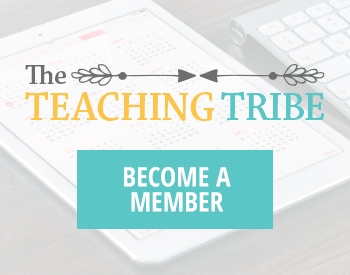 Perhaps God is helping to create the classroom I envision in my mind! Thanks so much! 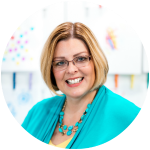 Hi Debbie, I’m glad this post was timely for you 🙂 Best of luck with your writing center! Hi Kathy, Thanks for stopping by, I’m glad you like the series so far. Love you ideas! Will have to work on this. Moved back to K after doing 4th for 1 years and 2nd for 2 years and Kindergarten is now full-day for the 1st time. Looking for ideas for the 2nd part of my day. Have done half -day K for 16 years. Hi Kay, Congrats on full-day K! I loved going full-day after being half-day for so many years. Glad you liked the post, thanks for stopping by. This looks great and is inspiratational! Do you have any suggestions on how to help children learn how to care for the supplies and put away? Reorganizing the writing center takes my aide or myself a chunk of time every afternoon- I have a mixed 3 and4 year old class. I am of course happy that the center gets so much use. I suggest introducing each item in the center gradually, modeling the proper uses as well as non-uses, and how to clean up. Also, adding a picture of the item to the end of each tub and a taping a matching picture to the shelf helps a great deal. I also have a center sign in each center with a picture of what a clean center looks like. Whenever you see that they are not using the materials properly or you notice that the center in general is messy mention it briefly to the whole class, like “Oh my, it looks like we need to go over how to use the writing center again because some of you are forgetting. We’ll talk about it tomorrow.” Then, the next day before center time say something like “Remember how messy the writing center was yesterday? What do you think we should do about that?” Listen to some suggestions, then review the materials and their uses again as well as how to clean up using the children as the guides. If caps on markers are a problem sing a little chant like “Caps go on the markers, like this” and then make a clicking noise (they love to make clicking noises!) Hope that helps! Hi.. Just wondering, Where do you get the alphabet punches from? The ones pictured look like a decent size and sturdy…. Your website has been a huge help to me! 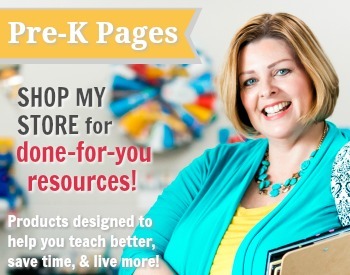 I love all your ideas, and I have incorporated many of them in my classroom. Thank you! What are the crayon/pencil cups inside the crayola supply caddies? Are they something you made or purchased? Thank you for sharing your great ideas and your tips for organizing. 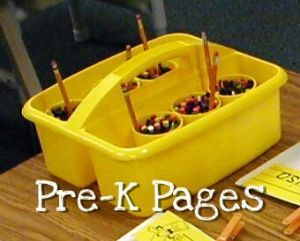 My Preschool students (3s going on 4) are ready for more letter and “writing” activities. And they love to glue! They would make good use of the pasting pieces. Where did you get them?